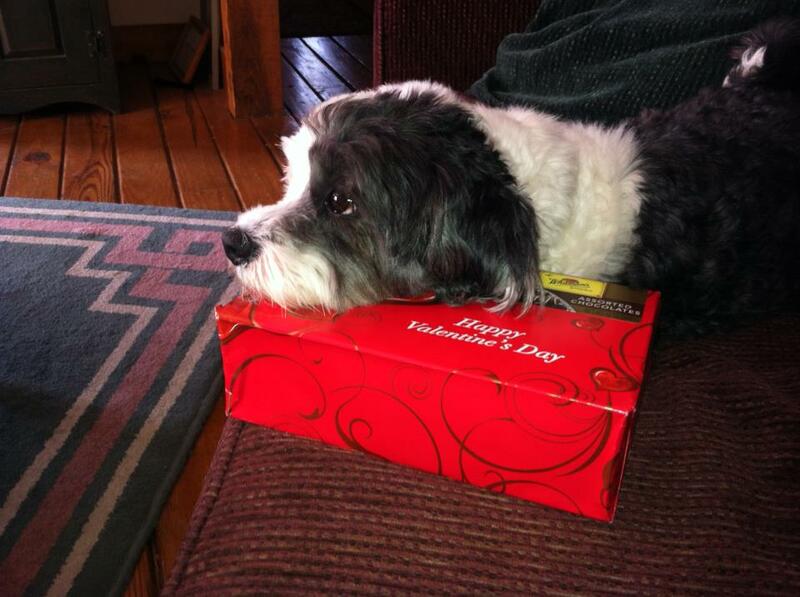 Teddy uses a box of chocolates as a pillow! This will be a quick post and the “last” in the series of fostering begun last month. I am happy to report that Teddy (also known as Ch. Theodore Ruxpin of Midstreams Manor, voted Best-in-Deed by his new family) is adapting to his new home with us. Many of you may know that Teddy came to me as my second foster and never left! When you foster a dog or a pup (or cat), you become the CEO, administrator and head bottle washer of your own personal shelter. No cages, no stress, no loneliness. You are offering the most home-like sheltering situation possible for a displaced, scared animal. Through your time with your foster pet, you can see them blossom. You help with their training, assess their temperament and give them emotional and physical care they cannot receive in a crowded shelter facility and their placements in their adoptive homes work because they are the result of good matches. By taking a dog or pup out of one of those facilities, you are freeing up a spot so that another pet can have a second chance at life. I hope to return to Fostering this summer. I have met some great humans in this process, too, and love to see the “Going Home” photos they post each time a family happily welcomes a new family member. 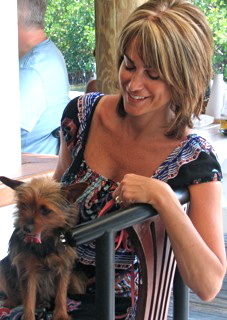 I thank Lynne Fowler and her hardworking group, Oodles of Doodles Rescue Collective, in New Jersey for working with me. If you have become curious about Fostering, please feel free to contact me for referral. The other day I saw a news story about something called, “Thank Dog Boot Camp,” http://www.thankdogbootcamp.com/ where humans and their dogs get a great work out together. I have seen similar programs, but I would love to see that offered here in Brick Township on one of our refurbished beaches or a place like Windward Park. Recently I saw author Darlene Arden post about the work of scientists who are using dogs to detect cancer in humans. Years ago I interviewed a researcher at the Pine Street Foundation in San Francisco about their own work on this topic after watching a show about Portuguese water dogs that were being trained for cancer detection. Good stuff! In closing, I share these words from Foster Extraordinaire, Jan Todd on her sensitive views on Fostering. After fostering about 50 dogs in the past 4 years, I can truthfully answer, it’s not easy but it is so very heartwarming. I treat each foster as if they are my own. I love them but do not fall in love with them. Sometimes I’m a nurse for a doggie with a cold, sometimes I’m helping rehabilitate an abused dog, socialize traumatized pooch, or nurse an injured dog back to health. The length of fostering time varies per dog. I have had some for a week, others for months. Whatever the reason they are visiting with me, it’s to save a life. If foster parents didn’t step up many lives could be lost. Have I ever been a “foster failure?” (A foster failure is what the world of fostering refers to when you adopt your foster.) I did adopt my once foster, Macie. She was paralyzed and all broken up, thought to never walk again. After months of surgeries, patience and most of all love, Macie now runs like the wind! Sometimes, there is one you just can’t let go. When it is time for them to go, tears are always shed. These are tears that I do not regret shedding. Most all of time my fosters are on their way to their new adoptive homes so, a very large smile is always added to the tears. When my job is done, I’m ready for the next dog as there is always another one waiting for help. A Happy Valentine’s Day from National Dog Week. The season of love and dog shows intermingles once again this February and we are again reminded of how passionate the human dog bond can be. I have friends and colleagues who breed and show dogs, friends who foster and rescue them and others who advocate tirelessly for their welfare. I commend those who have their hearts in the right place and always strive to do the best for all dogs and proceed with the most humane motives. As I edit a chapter about Will Judy’s take on the world of dog showing, he never waivered from his message that a spirit of kindness toward dog and fellow human were the goals of any event that showcased dogs. 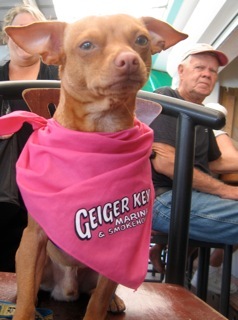 An astute breeder of dogs and dog show judge, Judy never forgot that all venues that celebrated the canine should bring out the best in all of our actions and words. He never took things too serioulsy and saw the value in all kinds of dogs whether purebred or mixed. May all organizations that purport to be FOR dogs actually take responsibility for their words and actions and always do the right thing. 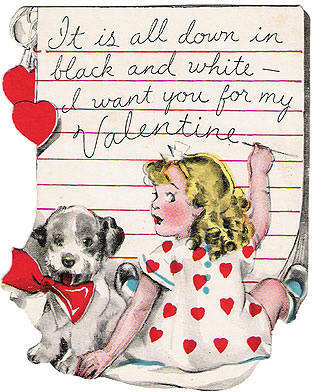 Good luck and love to all this Valentine’s Day. Here is the second part of my interview with Lynne Fowler who represents the Oodles of Doodles Rescue Collective. Each week it warms my heart to see her group find the most wonderful homes for so many dogs who got the second chance they so deserved. How is a prospective match for each dog made? Is there a pool of applicants? How are they screened? Our VA Partner or the foster mom will help write the ads we place based on the personality of what they know about the dog. An ad is placed on Petfinder and Adopt-a-Pet and we ask for applications. Every app that comes in is screened by me and if looks close to what we asked for in the ad, it is sent to the foster mom. She will call and interview over the phone and if she likes them for that dog, she will arrange a meeting. She will check references from the application and meet the family at their home. If there is a distance involved, we ask someone we know, maybe another foster in another area if they can do the home visit. Why do you think so many people are reluctant to foster? I think most people are afraid they will get too attached and feel the need to keep the dog. And, it does happen sometimes. But in general, it is such a good feeling to foster a dog, know where he came from and then see him off to his own life. It is very rewarding, even addicting. I miss having a new little one, when it has been awhile between fosters. When they do, what are they most surprised to learn from their experience? I think they are amazed at how good it does feel. Seeing pictures of their foster learning and loving their new family, is a wonderful thing. Many shelters do not offer a dog or pup a comfortable or safe experience due to over crowding and lack of funds. How can a foster home improve a dog’s potential to be adopted? How do the animals benefit physically and emotionally? Many shelters do nothing for a dog in it’s care until an adoption or rescue is taking that dog. Matted, hurt doesn’t matter. I have read stories of dogs sitting in shelters with broken bones and nothing done until volunteers spread the word and a rescue steps up to take that poor dog. Dogs in shelters are afraid, it is loud and cold there. The look in their eyes says it all. Many times, a dog will growl or snap out of fear, and then is labeled an aggressive dog. He will not be seen by adopters in this case. Some shelters are “hell holes” and dogs don’t stand a chance of living through their ordeal there. Some shelters have wonderful volunteers who tirelessly work to network and call attention to the dogs in their shelter. Facebook has been a huge help in calling attention to bad, even corrupt, shelters; to dogs who need help, and to unite rescues. Once a dog is pulled from a shelter, he is vetted, quarantined and then transported to the rescue. His true personality comes out in a loving foster home. I know in my home and with my pack, the foster dog starts to come out of his shell by day 2 or 3. You can almost see them blossom as they learn to trust. Their first meal of “real” chicken and rice is like a dream and by the third day, they are sitting with the pack waiting for dinner. I love seeing this. The fearful dog starts to relax, even play. It is one of the most rewarding parts of doing this. With so many puppies needing homes, how can Spay and Neuter initiatives be improved in the regions in which these dogs originate? Many Southern towns do not have mandatory rabies or leash laws, as we have here in the Northeast. Dogs are born, live their entire lives running loose, around the town or property or wander the woods. There is no uniform laws anywhere in this country and under most law codes, dogs are considered “property.” Establishing property is hard when it is an animal who has only been coming and going by whim. Many end up in kill shelters as strays and no-one comes for them. It is a pretty sad story for a majority. Pushing for mandatory spay/neuter is difficult as there is still a “good ole boy” attitude in many areas and neutering is believed to somehow affect “manhood,” I guess. The only initiatives I know of, usually generate from local rescues who harp awareness and in the case of feral cats, there are many groups who Trap, Neuter and Release. Does a portion of an adoption fee go toward a S/N fund? Do you find the veterinarians of the region are willing to step up to the plate and help with S/N efforts? All our fees go toward vetting, transporting and caring for the dogs in our care. We do not have a separate S/N fund, it is all vetting and needed. Here is the Northeast, S/N is very expensive, compared to down South. The same dog I can have spayed in Virginia for $125, will cost $500 at my vet, which is why I have dogs vetted before they come. Our rescue vets around the state and nation, will give us a Rescue Discount, but it is usually about 15% and it’s still less to have the vetting done in the South. There are a few clinic type places, like Monmouth County SPCA and Friends of Animals, that do spay/neuter for a lot less, but generally our S/N is done before the dogs arrive. How can more people be encouraged to give fostering a try? What would you say to a family who may want to get into fostering? It is very hard to find volunteers. We talk about it, advertise, show happy “Go Home Pictures” but most people have their preconceived notions that it will be hard to do or hard to give up the dog. But it is so needed. What are some of the greatest expenses you face in caring for dogs that Oodles Rescues? Our main expense is vetting. Many Southern dogs have NEVER had any vetting. All need to be wormed. All need to be heartworm tested. All need rabies and vaccinations. 99% need to be S/N. In 2011, we had over $20,000 in vetting. I am still working on 2012 bills, but know we surpassed that. Do you think school systems can help incorporate what you do in their Character Ed Programs. Have you seen this done? There are programs coming into schools to read with children and other things. But, I have seen where it is hard to get school boards to agree to the program for a variety of reasons like allergies. The dogs need to be certified as Therapy dogs and poodles are a great choice as it gets around the allergy problem. I would love to see more programs offered, especially in inner cities as the prevalence of a dog fight culture, exists. Many libraries have a read to a dog program now, too. If some can not foster, is there a way they can help? Most rescues are small and run by just a few individuals, so there aren’t many “jobs” to be done. Each foster mom runs their own fosters, process their apps and their Foster “Business.” Larger shelters are always looking for volunteers to help walk the dogs and such, but I know with the Monmouth County Shelter, there is a training class needed. The major need, as long as the condition of unwanted pets remains the way it is, is a loving foster home.